Telling The Stories That Matter: March 14 - Fannie Lou Hamer, Civil Rights Activist, "the lady who sings the hymns," "that illiterate woman"
March 14 - Fannie Lou Hamer, Civil Rights Activist, "the lady who sings the hymns," "that illiterate woman"
Reverend James Bevel had preached several sermons just like the one he had just preached. In it he proclaimed the liberation and healing that Jesus promised to those who would take up the yoke of discipleship. He fearlessly identified the racism inherent in the system and the use of it by those in power to oppress and repress black Americans. James Bevel was a part of the Student Nonviolent Coordinating Committee and was a friend and colleague of Martin Luther King, Jr. He was well aware that there were costs associated with activism because he had been involved in the activist life that led to pain and punishment at the hands of those who opposed them all. Yet at the end of his sermon he went ahead and asked if any of those who had heard it would volunteer to be a part of the solution--to register to vote even though it might cost them something significant. Fannie stood up and volunteered nearly immediately. She had already suffered at the hands of the powerful when she had been unknowingly sterilized a year before. The powers had decided that black citizens in Southern Mississippi could be controlled if they weren't allowed to reproduce--so they took it upon themselves to perpetrate atrocities. Fannie volunteered to become a voter and have her voice heard. Fannie lost her job as soon as her employer found out she had registered. She would later say of that night: "I guess if I'd had any sense, I'd have been a little scared - but what was the point of being scared? The only thing they [white people] could do was kill me, and it seemed they'd been trying to do that a little bit at a time since I could remember." Fannie's faith lent her a prophetic awareness of what was happening in the United States--people were giving up their lives piece by piece so that they might not lose it all at once. They were purchasing a degree of security by selling any hope of future security or equality. Given the lynchings and abuse suffered by those who did not agree to this Faustian bargain it is understandable but tragic. Fannie boarded a bus that was loaded with people like herself who were going to register. As they traveled and anticipated the vicious resistance that would meet them there, Fannie began singing hymns and inviting others to join her. As they sang "This Little Light of Mine," Fannie must have considered how this bus ride represented a painful commitment not to "hider [her light] under a bushel." Fannie's use of the hymns underscored to those who joined her that this was a spiritual struggle and not simply a matter of politics and influence. In the summer of 1963 she and others on a bus returning from a literacy class were arrested on a trumped up charge by police officers looking to punish black people for being unsatisfied with the status quo. They were taken to prison and were offered the opportunity to leave by the police officers. Though they were tempted to do so they refused because they knew what was down that path--the police officers would shoot them in the backs and later claimed that "those savage blacks" had attacked them and tried to escape. Instead, they were incarcerated, beaten savagely, and left unfed in their cells to defecate and urinate on themselves. Some nearly died from these abuses. They were eventually released when it was determined that their nonviolence could not be manipulated to defame or kill them. A year later she became a leader in a new political group known as the Mississippi Freedom Democratic Party. These "Freedom Democrats" insisted that Mississippi was unfairly represented at the Democratic National Convention--all of the delegates were white and there were active black voters in Mississippi. They insisted that changes be made and that Mississippi democrats needed to send black delegates. Lyndon Johnson became upset with this group because they represented a thorny political issue that would eliminate his southern support. Fannie was an easy story to cover for the news outlets because of her hymn-singing and soon Johnson was wondering what it would take to shut up "that illiterate woman." He sent a delegation to negotiate a compromise that might leave him politically powerful but Fannie was unpersuaded by their attempts to buy off their support and play political games. Her faith guided her and she rejected their compromise. She said she would "pray to Jesus" for them. She did but it cost her her seat on the negotiation committee. 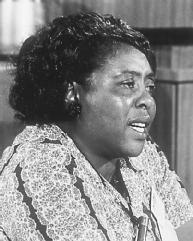 Eventually, a compromise was struck that stipulated that one of those delegates could not be Fannie Lou Hamer because she could not be trusted to play the political game. 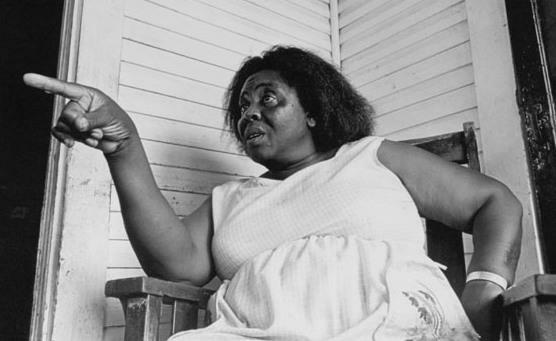 Fannie Lou Hamer died in 1977 and was buried under a grave marker that read: "I'm sick and tired of being sick and tired."